It's Time to Make Graduation Easier! These large plaques are custom made to your specifications, easy to read and understand, and they display 15 to 20 years! A great incentive for hard work and improvement in the classroom. Each year, simply e-mail names of award winners to levacs and matching plates will be shipped directly to your school! 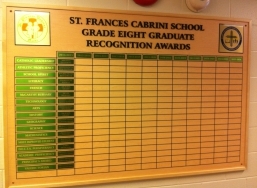 "We couldn't be more pleased with the "Graduation Board" that Greg designed and constructed for St. Gabriel school. It is aesthetically pleasing and well made. It gives our hallway a professional look and its organization quickly recognizes the names of students who were recognized for special awards in their graduation year. 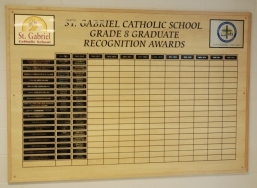 If you get an opportunity to visit St. Gabriel please feel free to take a look at our board; we are very proud of it and we are thankful to Greg and his staff for creating and installing it." "Our school community - students, parents and teachers - absolutely LOVE our new awards display board! It is a fantastic display for our award winners. The quality and workmanship of the board is beautiful. It will be admired for many years to come."